Fitzhugh Carter Pannill, one of the children of Dr. William Pannill and Carrie Maria Witherspoon Pannill, saw Hitler march into Vienna in March 1938 — 76 years ago. March 12 is the anniversary of the Anschluss – the political union – in which Nazi troops took over Austria in 1938. Wikipedia offers a brief account of the takeover, which violated the Treaty of Versailles and became one of the Germans’ major steps to war on September 1, 1939. The circumstances of the takeover – even to the referendum, which the Nazis called a plebiscite – foreshadow the Russian invasion of Crimea. F. C. Pannill was a lawyer, born July 8, 1886, whose spent much of his life overseas. We knew him as Uncle Fitz, he being a close friend of our grandfather Judge William Pannill, who was ten years older. After graduation from Corsicana High School, Uncle Fitz enrolled at the University of Texas to study law . He dropped out a year later. Family finances were thin, and his father had died at age 52. Fitz moved to Houston and became a law clerk to Judge James L. Autry, which allowed him to read law for the bar exam. After a short career in private practice, Fitz went to work in Mexico for an oil company. This was only a few years after Spindletop. 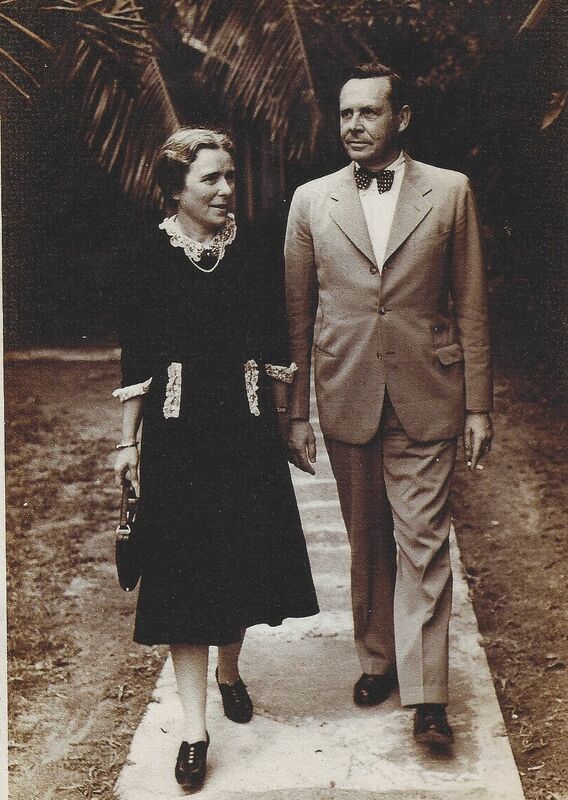 Fitz also met and in 1916, married Lelia Tudor Torrey, daughter of an old Houston family. They returned to Latin America and lived there with their three children: Rebekah Witherspoon Pannill, Fitzhugh Carter Pannill, Jr., and Lelia Torrey Pannill. By the 1930s, Fitz had joined Standard Oil Company of New Jersey. He was working in Central Europe in 1938 to acquire oil leases for the company. I left B. at 4 P.M. on Sunday and arrived in Vienna four hours later. Paul Ruedumann went along with me and his several years’ residence in V. (Wien in German) was a tremendous help. You will recall that the German troops crossed into Austria on Sat at 5:00 A.M. and Hitler was expected momentarily in Vienna. It developed however that he tarried in his native village of Brannau for the night of Sunday to place a wreath on his Mama’s grave (I’ll bet the dear old peasant lady not only turned over but “rapidly rotated”). By a miracle the local manager got us rooms the second rate Hotel Astoria but being accustomed to first class arrangements and not knowing of the manager’s reservations except that over the telephone he said he had such, we managed with difficulty to avoid being run down by the hundreds of German trucks with newly arriving German soldiers and stalked into the regal Hotel Imperial right past several German sentries. The Porter, a friend of R’s looked quite surprised and asked how we got in and we told him on foot each carrying his own bag. The fellow looked astonished and stammered that the whole hotel had been taken over as H’s headquarters and all guests were made to leave. A telephone call to the manager (who is a Jew and a tragedy and of whom more later and therefore terrified to leave his home to meet us) informed us of the Astoria. That hotel was on the other side of the principal boulevard – Ringstrasse – down which the arriving Germans were proceeding and great rate and was lined by millions of apparently jubilant, yelling humans. There was no possibility of getting through as the crowd evidently thought H. would drive with the soldiers – so we went to the house of the manager – Mr. T[aussig] to discuss the situation and then and there walked into the stark presence of the tragedy of race persecution. He is a cultured man of high attainments – She a charming gracious lady both in late fifties – 2 grown sons and married daughter and one grandchild. While Jews by race, they have been Christians for generations. Their lovely apartment overlooking one of V’s charming squares reflects impeccable taste and filled with lovely things. Franz, the second son, is one of V’s most famous artists and yet H. says they are not Austrians (Germans now). Their only hope is in the chance that H. now with power does not have to prove that power and may not follow the same course in Austria as he did in Germany. In the course of our two days visit we dined with the Ts and saw our parade from their window. I am still upset from the goodbye she gave me when she said “May God bless you and your family and may we keep strength from the fact that we have good friends like Mr. R is and I know you to be.” – terror written on her face. They have plenty of means and a lovely old place on the Adriatic but if they are able to leave Austria they can take nothing – and all frontiers are closed to them. I might sympathize with H. if I knew him to be sincere in only wanting to amalgamate the Germanic people and if he offered some humane solution to the Jewish problem which he has created. There are some 16 million in the world and even Stalin would I believe think that a larger number of people to kill. H. takes more or less the same economic attitude toward the Jews that the Allies did toward the Central powers when they made that silly Trianon treaty – i.e. He acts like all he has to do is to persecute and cripple and banish them – but they still have to exist somehow unless they are all massacred and made into fertilizer. (ink gone and I hate that pen) Speaking of Trianon, I witnessed yesterday in Vienna the last act of the Austrian drama which was writ in the treaty. This act of Hitler’s was inevitable. There was nothing Austria could do and there was nobody she could turn to. England and France don’t count much anymore, it seems. Whatever their desperate dilemma was caused by I really believe that a vast majority of the people in Vienna yesterday were glad to see Hitler – probably it was a case of let’s get it over with. He actually arrived Monday evening about seven o’clock and I was one of the several millions who saw him wave numerous times from the hotel balcony. By the time he arrived the German soldiers and the Berlin police had everything in hand. The Viennese soldiers and police were given a holiday, I suppose. I never was more amazed at the order and discipline and efficiency . Here these strangers directing a strange crowd of some five million, they say, No disorder – on the contrary wild frenzy of joy and the kindest handling of the crown by the soldiers – I was much impressed by the fine type the soldier is – no more ____ looking or maybe they don’t send them out on duty of that sort – seems after Mr. H. got thru bowing it was announced thru the loud speaker set up all over the city that he would make two appearances in V. A speech at eleven in the Hellenplatz and a review of the army he brought with him at one – I was on hand for the speech and saw him quite well twice – as he arrived and departed. He is a dapper little fellow and his pictures are quite like him. It was a thrillingly sad occasion to see the frenzy with which the Viennese welcomed the man who had come to put an end to a nation and a culture more than a thousand years old – I fear they will repent for the Austrian has only the language in common with the Prussian – what a glorious place Vienna is. Never have I felt so thoroughly as if the gardens and the palaces and the churches were partly my own. In spite of the political excitement I had time to realize what a tremendous influence on the best manifestations of culture in our own country Vienna has had. I could picture the gay spirit of the place for it even communicated something to the common German soldier – I never saw such a good natured happy throng. How I should love to loaf about a week with you and the young in Vienna – and we must remember – Hitler is an Austrian – Let’s hope he will be kind of Vienna and not go round draping statues and trying to reform her. In any case, it will be writ in my record “He was in Vienna when Hitler went in and Austria ceased to be” – We had no border difficulties and I really believe I might have shaken hands with H. if I had wanted – Why not! We got into his headquarters and oh by the way, once we were in the Imperial we asked if we could dine there and they said yes – and we did – surrounded by half the Hitler staff who had ______ On ice in advance? “Fools rush in?” It was all very interesting and exciting and had it not been for the personal equation with the Ts I should have said “maybe a sad day for the Austrians for they know not what they do, but thank the Lord I have a little red passport from a country FDR cannot ruin – try as he may”. But the tragedy of that woman’s suffering will always linger with me and I could not sleep last night. We left Vienna at 8 P.M. Tues. and arrived here at 11 – No trouble at border but lots of scrutiny – The stores were closed almost every hour in V. but I did manage the hat from the Tirol and a belt and color or two and some Viennese scarves. Gee! How I did like that town – not so breathtaking as this in physical beauty but just the place for waltzes and lovely ladies – come on over! It is now 8:30 and I was ready to pile into bed and have supper when this Dutchman (Shell) phones and pleads with me to come to his house and I have to go – Dammit!! They are very attractive young people tho and want to hear about Vienna – you will hear a lot about it. Perhaps Dr. Schussnigg could have saved Austria as a nation if he had been wiser – Quien Sabe? This Lelia’s daughter Ellen Birrell. Yeya and I were both moved to read this letter, so thank you for making it available. I am wondering if you are in possession of the letter or just the transcript. If you have the original perhaps we can scan it so all us Pannill descendents could have digital facsimile?